[114 Pages Report] Biosurfactants Market size was valued at USD 3.99 Billion in 2016 and is projected to reach USD 5.52 Billion by 2022, at a CAGR of 5.6% during the forecast period. In this report, 2016 is considered the base year and the forecast period is from 2017 to 2022. Asia Pacific is the fastest-growing market for biosurfactants due to the technologically advancing and emerging countries in the region demanding innovative, biodegradable, renewable, and less toxic biosurfactant products. Key manufacturers of biosurfactants include Ecover (Belgium), Jeneil Biotech (US), Evonik (Germany), and Biotensidon (Germany). This report categorizes the global biosurfactants market by type, application, and region. The global biosurfactants market is estimated at USD 4.20 Billion in 2017 and is projected to reach USD 5.52 Billion by 2022, at a CAGR of 5.6% during the forecast period. The increasing demand for green solutions primarily in the personal care, and home care industries is expected to drive the growth of the global biosurfactants market. Based on type, the global biosurfactants market has been segmented into glycolipids and lipopeptides. The rhamnolipids type under the glycolipids segment is projected to grow at a higher CAGR due to higher purity levels and enhanced functionality. Rhamnolipid biosurfactants find major use in agricultural chemicals, pharmaceutical, and personal care applications. Based on application, the global biosurfactants market has been segmented into detergents, personal care, food processing, agricultural chemicals, and others. The detergents application accounts for a significant demand for biosurfactants, as home care is the largest industry using surfactants. Biosurfactants show enhanced properties as compared to chemical surfactants in terms of removal of hydrophilic stains, optimum performance under neutral conditions, and easy degradability. 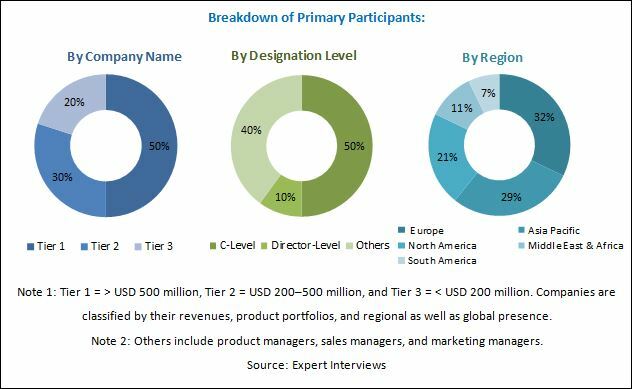 By region, the global biosurfactants market has been classified into Asia Pacific, Europe, North America, Middle East & Africa, and Central & South America. 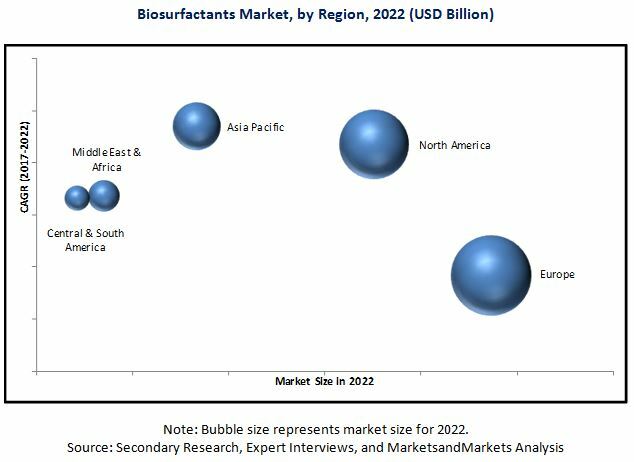 Europe was the largest market for biosurfactants in 2016 and is projected to lead the biosurfactants market during the forecast period. The European biosurfactants market is largely driven by the increasing awareness among consumers towards the protection of the environment from toxic chemicals. This is primarily due to the stringent laws enforced by regulatory bodies, largely monitored by REACH. The major factor restraining the growth of the global biosurfactants market is the high production cost as compared to conventional chemical surfactants and bio-based surfactants. The high raw material cost, lower productivity, and cost associated with the product purification steps are some of the factors responsible for the high overall manufacturing cost of biosurfactants. Some of the key players operating in the global biosurfactants market are Evonik (Germany), Jeneil Biotech (US), and Ecover (Belgium), among others.